Could Diversification, Bean-less Brews Hold Keys to Coffee Sustainability? - Sustainable Brands Could Diversification, Bean-less Brews Hold Keys to Coffee Sustainability? A new report outlines how coffee farmers in Vietnam, the second-largest producer of coffee in the world, can reduce their carbon (CO2) footprint by growing different plant species alongside coffee. The study, Source or sink? The carbon footprint of Vietnam robusta coffee, is based on research from IDH, The Sustainable Trade Initiative; compiled by Agri-Logic; and based on the work of coffee traders JDE Coffee, Lavazza, Olam and Acom. IDH recommends farmers to use a diversification model with a non-coffee plant canopy density of at least 30 percent; this will maintain the annual production of coffee at three tons per hectare. Pepper, durian and avocado plants were found to be the most suitable for intercropping at this density. Together with improved fertilizer and water use, this diversification could significantly reduce the impact of coffee production on climate change (which then ravages coffee and other crops). Farmers can also broaden the range of income sources available to them, increasing their climate resilience. The findings come amidst reports that coffee production around the world is in trouble: A recent study in Science magazine projects that 60 percent of the world’s coffee species are in danger of going extinct in the next 50 years — due to climate change, population expansion and disease; and the Vietnam Coffee and Cacao Association released a report earlier this month that predicts severe droughts could considerably reduce the country's coffee output this year. Coffee production has a huge economic benefit for the Central Highlands region of Vietnam, where 95 percent of its coffee is produced. At the same time, it is a source of carbon emissions through significant use of fertilizer, water and energy. The report found that monocrop coffee farms are net sources of carbon, releasing 0.37 metric tons of CO2 from the atmosphere per year per metric ton of coffee produced. Conversely, diversified coffee farms are carbon sinks, removing 0.16 metric tons of CO2 from the atmosphere per year per metric ton of coffee produced. Growing pepper, durian, avocado and other crops alongside coffee creates more biomass, sequestering more CO2 than is generated through production. Of the small number of monocrop farms that did sequester CO2, more efficient use of fertilizer (the leading driver of carbon emissions in coffee farming) was found to be the reason. The result? A naturally derived and sustainable brew with the same caffeine you’d expect from coffee and no harsh acid or bitterness (though a request for even a hint as to the nature/origin of these "sustainable" ingredients was fruitless, as of press time). 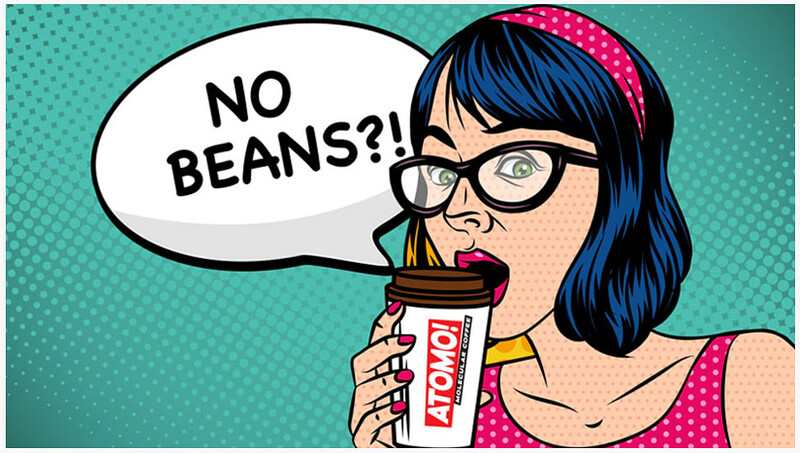 Atomo was conceived by food scientist and co-founder Jarret Stopforth, Ph.D.
Atomo ground coffee can be used substituted ounce-for-ounce with regular ground coffee — in drip machines, French presses, Aeropresses, refillable K-Cups, pour-overs, or however you take your morning brew. Atomo points to the aforementioned Science study predicting the demise of most of our coffee species, and the fact that forests are being cleared every day to make room for new coffee plantations. The company asserts that its new brew is produced without the need for deforestation, pesticides or any other environmentally impactful practices, and contains none of the harmful carcinogens that develop during the coffee-roasting process. Earlier this month, Atomo raised more than double its $10,000 goal on Kickstarter; Atomo is scheduled for commercial release in Q4 2019.